...that I have become the most boring blogger. Time to pack it in? I'm hanging on with the hope that I will be inspired some day soon to write very interesting posts. Until then, it's Daybooks and sewing posts. My apologies. And this is something I've been thinking about a lot too. Not the packing it in part because frankly, I don't think I could give it up all together. My blog is my memory annex and without it I wouldn't be able to remember half the stuff that happened over the year. But feeling like a boring blogger... yeah, I get that. I think it's partly the fault of the time of year. The holidays, with all their excitement, are over and life feels more boring right now. My living room certainly looks more boring with all the decorations taken down. :( No longer are my thoughts turned to feasting, festivity and play, but rather "let's get back on track" (food, money, chores, school... you pick the subject) and "I need to make those dentist appointments". And if you happen to live somewhere where it's too cold to go outside long enough to run an errand or run to the library, then it's even worse in my opinion. So, my point is... life is kind of boring right now for all of us. But I think reading someone else's boring blog post is like calling up an old friend to chat about nothing in particular. It's just nice to hear their voice. Gratuitous baby shot. 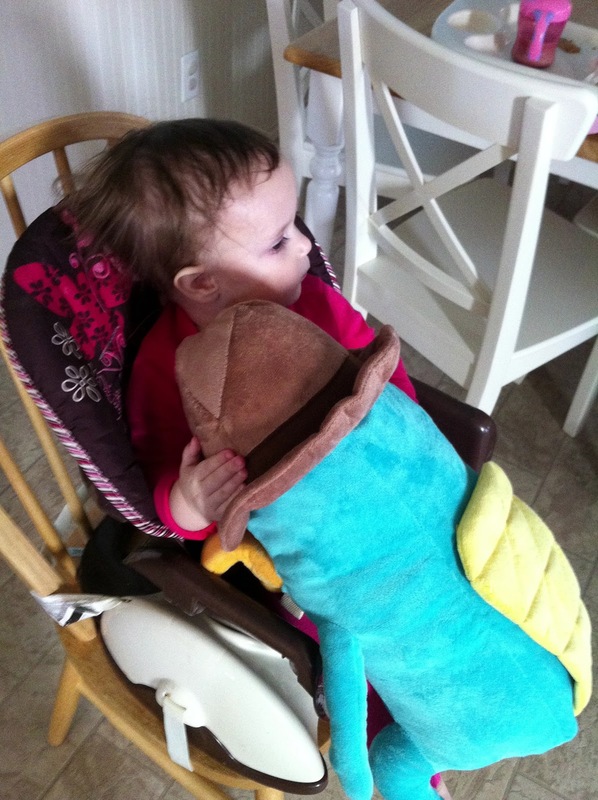 Yes, she is hugging a giant teal platypus wearing a fedora. Why, you ask? Because her daddy is a sucker for baby giggles. This time of year is boring. I considered throwing in the towel too but then realized that it is nice to have a small group to communicate with online. It is just like checking in on a friend, whether life is over the top crazy or simply your every day life. Thanks for this little post. I would have had no idea what that stuffed animal was but I sure love the teal color! Our family has only recently been introduced to the cartoon that features this colorful creature. My husband has a co-worker who loves it and showed it to him. The humor is right up a computer guy's alley. He has been sharing some episodes with the kids in the evenings. I like to think now is ordinary and regular; and busy, not boring. My posts get written in my head, and then the computer has a hiccup and the pictures don't get off the camera blah, blah, blah. Yeah, can relate. He almost is. I had to sew the tail to his back so that she wouldn't trip on it when she carries it around. Husband says it was her Epiphany gift. If we can get through January, there will be a ton of Valentine things out there, right? Maybe we should talk on the phone instead of blogging. ;-) I need your number! I like that comparison - 'like calling up an old friend to chat about nothing in particular. It's just nice to hear their voice'. It's always nice to 'hear' from you, Charlotte! I think the 'everyday' posts help us to remember to find joy and gratitude and contentment in the ordinary. "But I think reading someone else's boring blog post is like calling up an old friend to chat about nothing in particular. It's just nice to hear their voice." So very true. I'm feeling a bit of post-Christmas let down myself--aggravated by feeling like I didn't really have Christmas properly what with being sick and all-- and yet am not ready to start back to ordinary life quite yet. Fortunately gratuitous baby shots are always in order. Thank you for sharing yours. I can't believe how big she's got! I still can't get Firefox to allow commenting on blogger blogs! So, for my 4th attempt, here's my boring comment! I like how you put this, Charlotte. I need to comment on Barbara's -- because if she's boring, I must be more boring, because I love posts like hers. They are "homey". I've been under the weather, lots of things going on, and I like the cozy updates of home. It feels like girlfriedn talk over coffee. I don't want spectacular or accomplishments. I like to talk yarn and sewing projects or ideas, worries of the day, projects languishing or planning, school discussions... I don't need to see successes. I want to know what's on your mind, warts and all. I read one of your comments about Valentine's day and Ash Wednesday. I know! right? We will have to do something special to work with it. We all feel that at times and it is so much fun catching up with others through their blogs! I had commented recently on another's blog, that when I blog about Pro-Life issues or offenses against Jesus and Our Holy Mother of God, few people visit and even less comment. I'm not a big crafter, but when I post about crafting, I then get visitors and some who comment. Even though we need "to be do-ers not just hear-ers"! I was told this evening that praying a rosary on my knees every day won't get me to Heaven. What will I say when God asks me what I've done for the poor, lonely, marginalized, persecuted, and the unborn. Good question and I'd like to have a good answer when I meet Him! Noreen, I wouldn't necessarily assume a correlation between the number of comments you receive and the level of interest a piece has for your audience. Some topics might move me very deeply but I won't necessarily be moved to comment on them. Other topics are of only a shallow interest but are easier to engage. Sometimes chitchat about the weather is easier than exploring big issues. Not because I don't care about the big issues but because they take more time and energy to engage with. Or because I need to go away and process what was said before I can begin to respond. Or because I feel the writer did such a great job that there isn't much left to say. Moreover, some pieces of writing invite discussion, ask open-ended questions, wrestle with issues and invite the reader to do the same while others feel more like proclamations or manifestos and don't leave the reader with much to do except agree or disagree with the author's position.